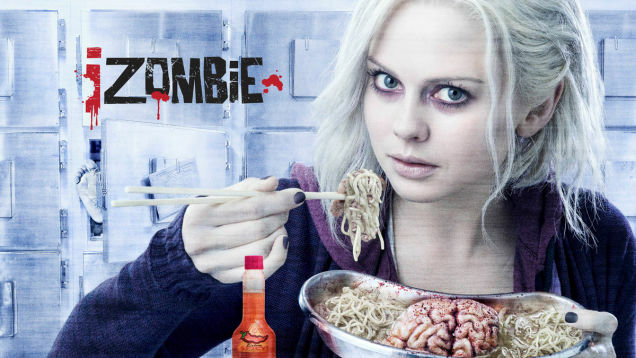 CW's "iZOMBIE" premieres tomorrow night and, though I'm usually not into zombie stuff, this show looks like it'll be interesting and fun and full of intriguing characters. And being about a zombie struggling to maintain her humanity, consumables (to brain or not to brain, and then how to brain) will play a major role. i09: You get your powers by eating brains, how many brains have you had to eat (up until now) while shooting? And what do they taste like? Rose McIver: So, so far we're aiming to eat a brain an episode. It's sort of the goal. And we've been playing around with different recipes on set. We haven't quite mastered it. We have like a fondant, icing, very, very sweet saccharine kind of brain. And then we also have a soy protein one, that's like tofu. Wouldn't recommend them. We're working on it, but yeah we get through quite a lot on set. 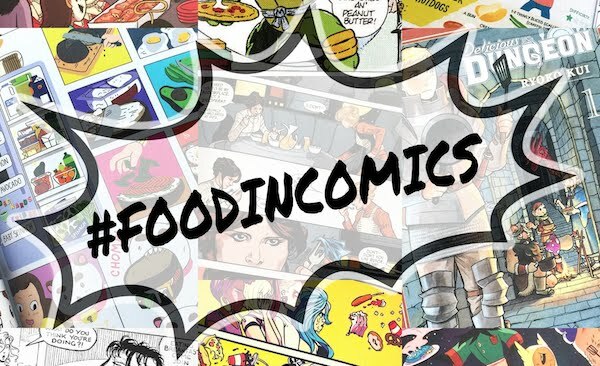 i09: How many do you eat while you're shooting one episode. Are we seeing you eat 6 brains? Are you getting sick? Rose McIver: I have a new best friend on set called a spit bucket. So I actually don't eat any of them really anymore. I go to craft services and get a lot of gum. And in between these soy protein meals, I spit them out and have chewing gum and freshen up. I decided to skip going the sweet fondant or styled bread route that would seem a little more obvious when making food in the shape of brains (tofu doesn't seem as obvious to me), and instead took inspiration from ingredients seen in the trailers, especially the "Fist Look" trailer (below), and used udon noodles and spiiiiice. "Why the hot sauce? Is that a zombie thing?" Also, instead of using a round baking dish for the recipe below to create one brain shape, you can use a mini muffin pan to create many squiggly brain bits. 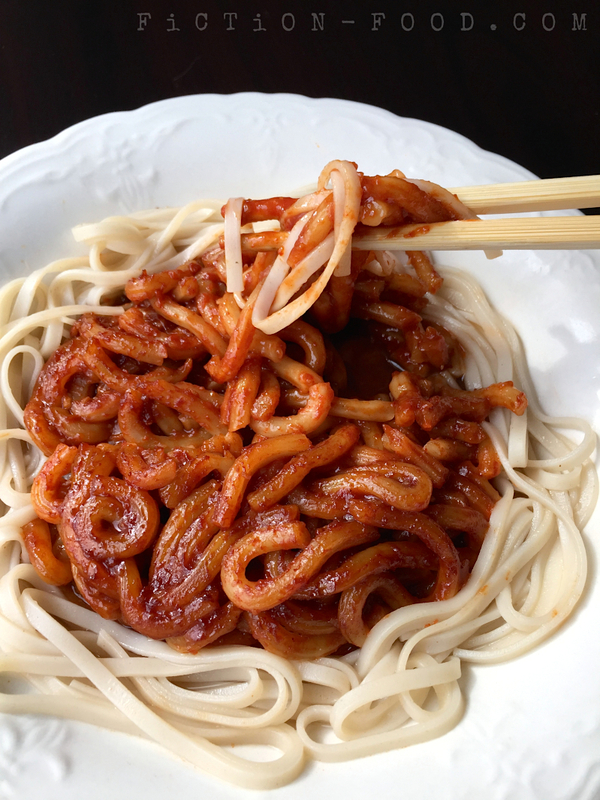 Simply separate the sauced udon noodles into the individual, non-stick-sprayed cups, and bake for about 20 mins or so. Place them in a bed of lo mein noodles with a little broth. 1. Making the Brain: Preheat your oven to 350ºF. Prepare the packet of udon noodles according to the package (I went the microwave route & poked holes in the packet & zapped it for 90 seconds). Put the cooked udon noodles into a medium bowl. Toss all of the sauce ingredients into a food processor & pulse until fully combined. 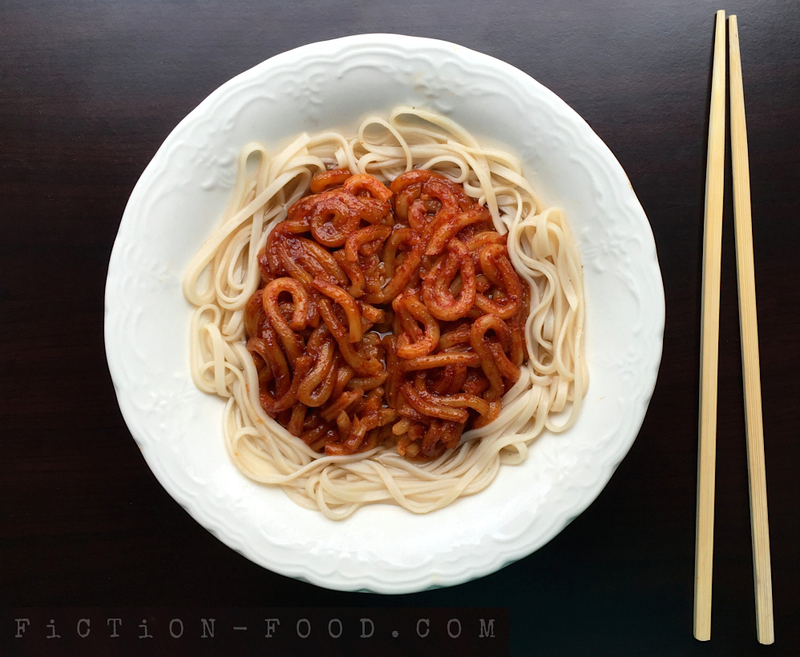 Pour it over the noodles & then gently coat the noodles completely with the sauce by using a spatula & a folding motion (you want to break as few noodles as possible). 2. Spray your round baking dish with non-stick spray & plop the coated noodles into it. Using the spatula, press the top of the noodles into as much of a dome as you can get & tuck in any stray noodle ends. Bake the noodles, uncovered, for about 30 minutes. Remove from the oven & let cool while you make the soup. 4. 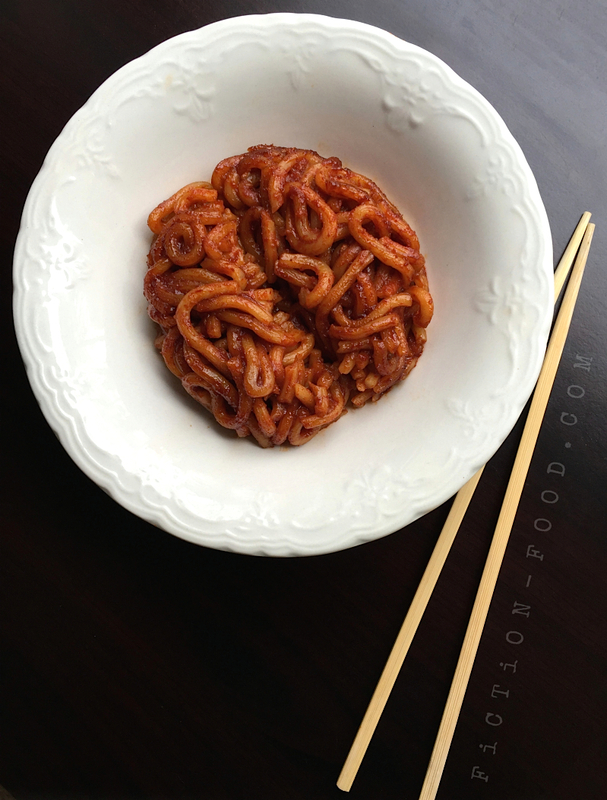 Shaping the Brain: Over turn the mound of spicy baked udon noodles into a large bowl (or kidney dish/emesis basin if you happen to have one) & tighten the shape into more of an oval using the spatula & your fingers (spicy fingers!). Using a large sharp knife, carefully cut the noodle mound down the center, & then get the shape back together again, making it slope down a little bit on either side of the cut so that it resembles a brain with its 2 hemispheres. Use a damp paper towel to wipe away any sauce on the sides of the bowl. 5. 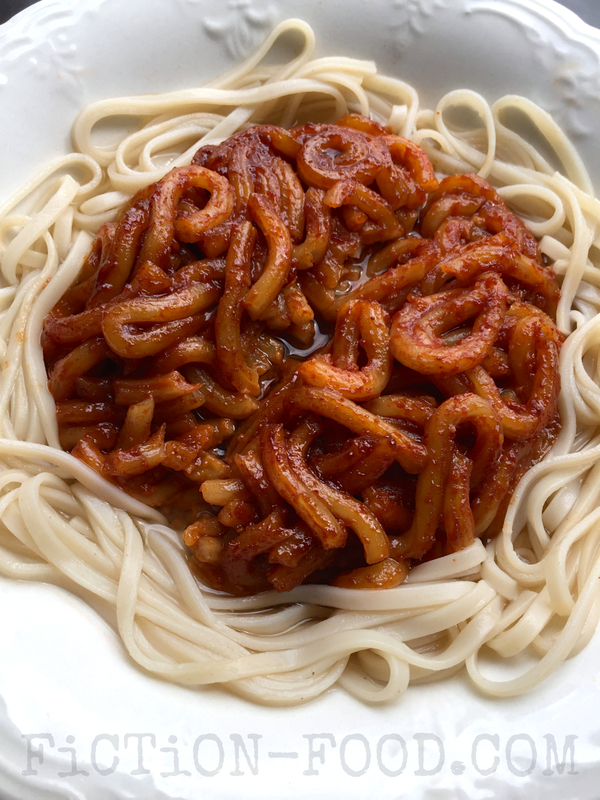 Placing the Soup: Using tongs or a fork, lift a small amount of cooked lo mein noodles out of the pot & place them around the udon "brain". Spoon some of the broth around the sides & serve with chopsticks. If you'd like straight spicy brains, feel free to skip the soup steps. 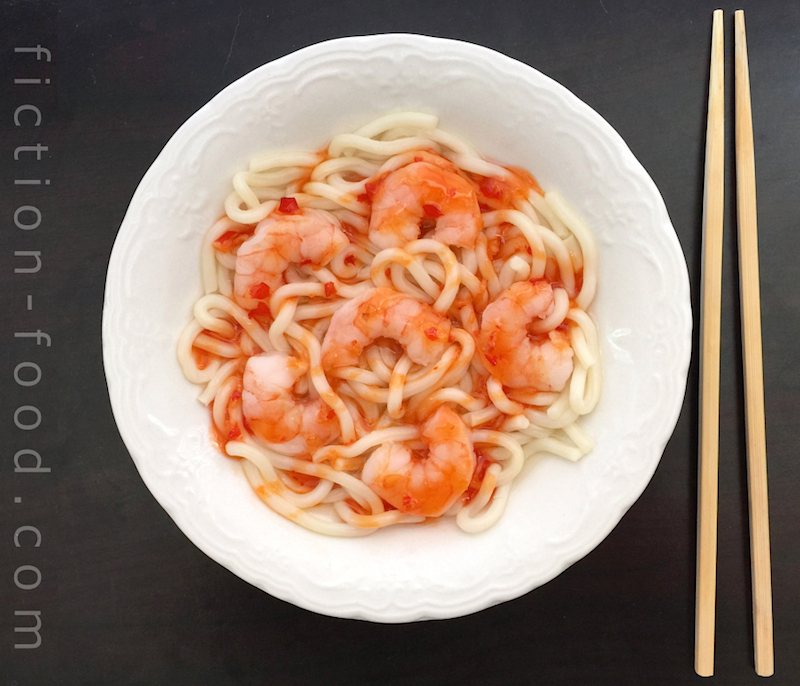 Easy peasy spicy brains using shrimp, udon, & hot sauce as mentioned in the note section above.